The life of a gingerbread girl..: Love cookies? Love Snickers? You're going to love Snookies! Love cookies? Love Snickers? You're going to love Snookies! If you're going to break your resolve for one sweet treat, make it a Snookie. 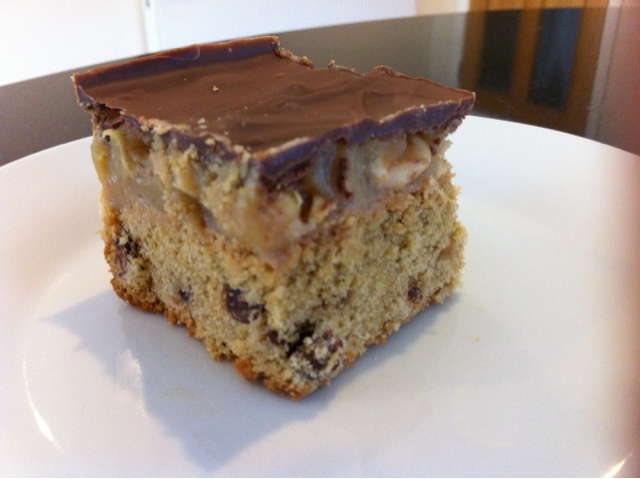 A Snookie is part cookie, part Snickers, and may be the most delicious thing I've tasted in quite a while! This may seem like there are a lot of steps, but it's absolutely worth the effort. Line 8" square tin with grease proof paper. 1. Melt butter over a low heat. 2. Mix in sugars until well combined. It's a good idea to sieve brown sugar to eliminate any naturally occurring lumps. 3. Beat in vanilla and eggs. 4. 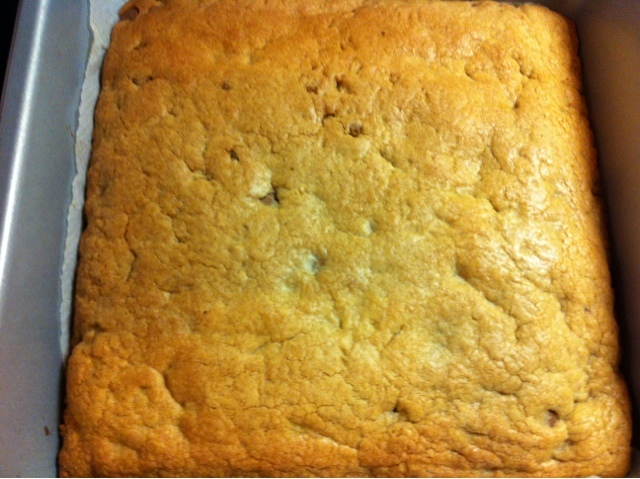 Finally add sieved flour, baking powder and chocolate chips. 6. Press dough into lined tin, smoothing the surface with the back of a damp spoon. 7. Bake the base for 20 mins/until a pale golden brown colour and firm. You can make a start on this while the base is cooling. 1. Add all the ingredients to a saucepan. 2. 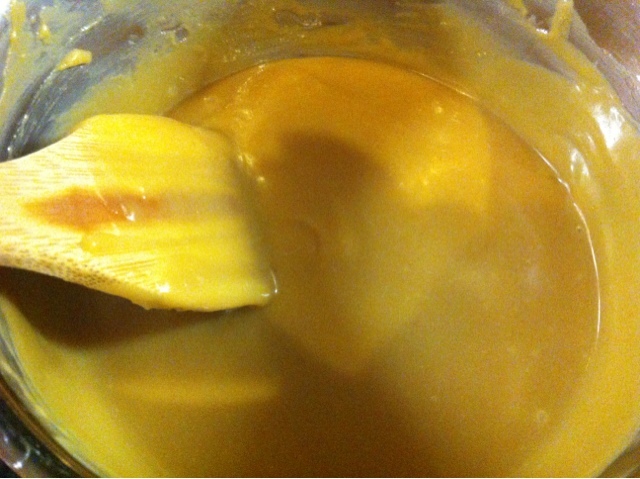 Over a low heat, keep stirring until you have a thick caramel consistency. Things to note when making the caramel... This is important so pay attention!! You need to do this over a low heat and have patience. Turning up the heat will give you burnt caramel, a saucepan I'd rather throw out than attempt cleaning, and the hassle of starting the whole process again. Have some patience! It's worth it. Do NOT stop stirring! 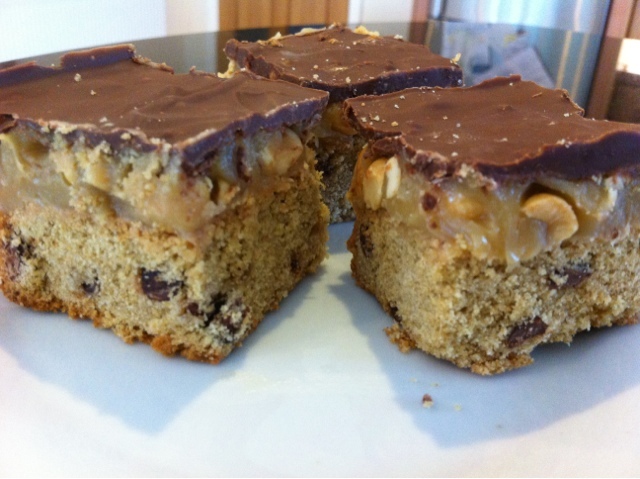 Again this will result in the ruination of both your caramel and saucepan! It only takes a few minutes so stick with it. Another vitally important piece of information.... Try not to taste the bubbling caramel... It's hot, and your mouth will feel like its on fire! Speaking from experience here... Totally worth it though! 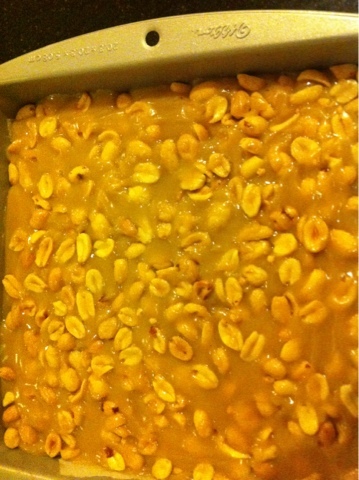 Top with a generous layer of salted peanuts. I used about 150g. Finally spread 200g of melted chocolate over the top. Place your Snookies in the fridge to set for 4 hours. I recommend cutting these into squares in the tin. This will stop the chocolate from cracking, and the caramel layer from oozing out the sides.